When the Winter Olympics started in 2010, the Law Library’s Pat Court wrote a helpful blog post on Olympics and the law, with many relevant links. We realized that it was time for a few updates since the Summer 2012 Games start in London tonight. The broken links in Pat’s post have been fixed. For recent coverage of the Olympics, see the Quick Reference for London 2012, which examines trademarks for this year’s games; this update on drug testing; Slaw’s Guide to Sports and Olympic Games Law; the Peace Palace Library‘s research guide; and, just published today, The Laws Behind the London Olympics from the Law Library of Congress. The Law Library is now accepting job applications for Assistant/Associate Director for Instruction and Research Services and for Faculty Services Librarian. Background: Cornell University is located in scenic Ithaca on a hill above Cayuga Lake in the Finger Lakes region of upstate New York. The town and University offer a unique cosmopolitan and international atmosphere in a beautiful natural setting of waterfalls, gorges, and lakes. The Law School has approximately 620 J.D. students, 75 LL.M. students, 25 J.S.D. students, and 52 full-time faculty, and is the home of the Legal Information Institute. The Law Library houses over 700,000 volumes and volume equivalents, and disseminates extensive legal information through its web site. The Library promotes a challenging environment which supports the use of new technologies with a tradition of excellent services. Professionals and support staff work closely with the Law School and the University Library. The Law Library is part of the Cornell University Library (CUL) system, and advancement is through the CUL promotion process. Position Description: The Assistant/Associate Director for Research Services and Instruction serves as a member of the administrative committee responsible for Law Library policy and management, and supervises the Head of Reference/Research Services and the Faculty Services Librarian. The position reports to the Law Library Director and may be filled at the Assistant or Associate level, depending upon candidate’s experience. Responsibilities: The Assistant/Associate Director for Research Services and Instruction takes a strong leadership role in the development and implementation of policies and services for the reference and instruction sectors of the library. S/he teaches a variety of courses and workshops, including the research portion of the first year Lawyering course and various research courses for upper level credit; leads the development of assessment tools for the research portion of the Lawyering course; coordinates with the writing faculty and other teaching librarians to design the Lawyering research curriculum; develops new course offerings; coordinates professional development in instruction for teaching librarians; and serves as Instruction Coordinator for the Law Library within the Cornell University Library system. The individual in this position supervises the Head of Reference/Research Services in the provision of excellent research and reference services to the Law School and University communities; serves on the reference desk; supervises the Faculty Services Librarian and actively participates in the Law Library’s faculty liaison program; assists in maintaining content relevant to reference and instruction on the Law Library website; and participates in Law Library planning committees and task forces. S/he actively engages in campus, regional, and national professional organizations and collaborative activities. Requirements: M.L.I.S. or equivalent graduate degree; J.D. from ABA accredited school or foreign equivalent; minimum of three years’ experience in a law library; supervisory experience; knowledge of legal research strategies; strong service orientation; demonstrable teaching skills; excellent written and oral communication and interpersonal skills; ability to work independently and function in a collegial, teamwork-oriented environment which emphasizes customer service and delivery of exemplary library research and faculty services; creativity and adaptability in the face of competing priorities; demonstrated service to the law librarian profession through professional organizations. Preferred: Knowledge of and interest in new and emerging technologies; demonstrated experience in developing projects and seeing them through to completion. Benefits: Competitive in salary, rank, professional development support, and benefits. Comprehensive benefits package including 22 vacation days, 11 paid holidays, health insurance, life insurance, and university retirement contributions (TIAA-CREF and other options). Professional travel funding available. Application: Position is available January 1, 2013; however, the start date is negotiable. To apply, go to: http://www.ohr.cornell.edu/jobs/, select job category “Librarian,” select job posting 18062 and follow the instructions for online submission. Please include a cover letter, resume, and the names and contact information for three references. Applications will be reviewed as received and the posting will close on August 24, 2012. For more information, contact Amy Emerson, Assistant Director for Access Services, 607-255-5441, aae25@cornell.edu. Cornell University is an Affirmative Action/Equal Opportunity Employer strongly committed to diversity. We value qualified candidates who can bring to our community a variety of backgrounds and experiences. Background: Cornell University is located in scenic Ithaca on a hill above Cayuga Lake in the Finger Lakes region of upstate New York. The town and University offer a unique cosmopolitan and international atmosphere in a beautiful natural setting of waterfalls, gorges, and lakes. The Law School has approximately 620 J.D. students, 75 LL.M. students, 25 J.S.D. students, and 52 full-time faculty, and is the home of the Legal Information Institute. 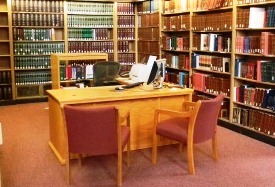 The Law Library houses over 700,000 volumes and disseminates extensive legal information through its web site. The Library promotes a challenging environment which supports the use of new technologies with a tradition of excellent services. Professionals and support staff work closely with the Law School and the University Library. The Law Library is part of the Cornell University Library (CUL) system, and advancement is through the CUL promotion process. Responsibilities: Under the supervision of the Assistant/Associate Director for Research and Instruction, the Faculty Services Librarian is responsible for planning and managing the Law Library’s faculty services program, which includes an active faculty liaison component and a faculty scholarship repository. S/he is responsible for developing and implementing initiatives to promote library services with faculty and for initiating and maintaining communication with faculty members regarding their specific research interests and needs. The Faculty Services librarian also hires, trains, and supervises law student research fellows to provide expert, timely, and consistent legal and non-legal research. Strong communication and interpersonal skills are required, as well as a demonstrated ability to work effectively in a collegial environment. The Faculty Services Librarian is an instructor in a variety of courses and workshops, including the first year lawyering course and various research courses for upper level credit, depending upon qualifications and interest. The Faculty Services Librarian participates in library planning committees and task forces and engages in campus, regional, and national professional organizations and collaborative activities, and is expected to be professionally active. Salary is competitive. Position is available January 1, 2013; however, the start date is negotiable. Applications will be reviewed as received, and the posting will close on August 24, 2012. Requirements: J.D. from ABA accredited school and M.L.I.S. or equivalent graduate degree from an ALA-accredited program; strong service orientation; excellent written and oral communication and interpersonal skills; ability to work independently and function in a collegial, teamwork-oriented environment which emphasizes customer service and delivery of exemplary library reference and research services. Preferred: A minimum of two years professional academic law library or related experience; demonstrated experience coordinating and managing faculty requests; teaching experience; knowledge of and interest in new and emerging technologies; experience with empirical and statistical research and resources. Application: To apply for this position go to: http://www.ohr.cornell.edu/jobs/, search under the job category of Librarians, select job posting 18061 and follow the instructions for online submission. Please include a cover letter, resume, and the names and contact information for three references. Jean Pajerek, the Law Library’s Associate Director for Information Management, is one of the presenters of “Launching into RDA: The New Frontier” at the American Association of Law Libraries conference this weekend. Jean also prepared “FRBR Meets RDA,” training materials explaining the relationships between the new cataloging standard, Resource Description and Access, and Functional Requirements for Bibliographic Records. “FRBR Meets RDA” has been nationally recognized as among the best freely available RDA training materials by the Library of Congress Program for Cooperative Cataloging’s RDA Training Materials Task Force. The Task Force’s report recommending Jean’s materials is available at the Library of Congress’s Catalogers Learning Workshop. At the conference in Boston on Sunday, July 22, at 3:45 p.m., Jean and her co-presenter, Patricia Sayre McCoy of the University of Chicago’s D’Angelo Law Library, will describe the Cornell Law Library’s and the D’Angelo Law Library’s experiences transitioning to the new standard ahead of three national U.S. libraries. Jean and Pat’s presentation about RDA at last year’s conference is available on YouTube. Our colleagues at the University of St. Thomas Law School library have released “Scholarly Impact of Law School Faculties in 2012: Applying Leiter Scores to Rank the Top Third.” We’re happy to report that Cornell Law School’s score, using the protocols refined by Professor Brian Leiter, is ranked at number nine. Gregory C. Sisk, Valerie Aggerbeck, Debby Hackerson, and Mary Wells explain that the Scholarly Impact Score measures the impact of a faculty’s legal scholarship on other legal scholars — the score looks at citations by other legal scholars, not by academic scholars as a whole. Moreover, it measures the impact of tenured faculty, not untenured faculty or faculty with a primary appointment in clinical teaching or teaching legal research and writing. The weighted score, upon which schools are rank-ordered, is twice the mean plus the median of each tenured faculty member’s citations in law reviews for the past five years (2007-2011). The study identifies the ten most cited scholars at each school. At Cornell this year, they are (in alphabetical order) Gregory S. Alexander, Kevin M. Clermont, Michael C. Dorf, Theodore Eisenberg, Valerie Hans, Michael Heise, Robert A. Hillman, Jeffrey J. Rachlinski, Stewart J. Schwab, and Lynn Stout. We have another new law librarian! 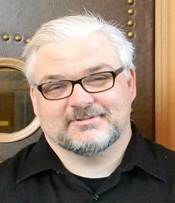 Please welcome Dan Blackaby, our new Technology Services Librarian. Dan will be responsible for implementing new technologies, as well as planning, maintaining, and enhancing the library’s web presence. He will participate in the faculty liaison program, and will also be involved in legal research and instruction. Dan comes to Cornell from South Texas College of Law in Houston where he worked as a professional librarian in various roles including research, technology, and acquisitions. After earning a B.A. at the University of Houston, he earned his J.D. from Michigan State University, an M.L.I.S. from San Jose State University, and an M.A. in History from California State University, Fullerton. Dan has a rich background in law librarianship, and has worked in different library settings, including the Montana Department of Natural Resources, Microsoft Corporation, the Santa Clara County Counsel, and Western State College of Law. Dan is actively involved with the American Association of Law Libraries, having served as an executive board member for both the Legal History & Rare Books and Computing Services Special Interest Sections. This past spring two free services for searching and following bills in the fifty states and the U.S. Congress have appeared. LegiNation, Inc. launched BillTrack50 in April. BillTrack50 has a free component and a subscription component. (More about the differences in a minute.) GovTrack, provided as a free service by Civic Impulse, LLC, has been around awhile as a source of information about Congress. In June, Civic Impulse rolled out state legislation tracking in beta. It draws its data from LegiNation and LegiScan, Inc., with some additional data from Open States. It turns out that having both is a good thing, as each provides free tools that the other does not. BillTrack50’s free product is called Quick Search. It allows the registered user to search simultaneously the bills of any or all of the 50 states, the District of Columbia, and Congress. The user can also choose to search a selection of states at the same time. The search engine searches the entire text of the chosen jurisdiction’s bills, and it allows the user to specify terms that the bill text must include, terms that it may include, and terms that it cannot include. Bills can also be filtered by sponsor and by bill number. The search results include state, bill number, bill name, a summary if available, latest action, and latest action date. A link by each result takes the user to details about the bill, including sponsor (with a link to a page with significant information about the sponsor), full bill text, action history, vote history, and associated documents. Full bill text includes previous versions, which can be compared red-line style. Bill text can be exported to HTML, RTF, or Legix (*.slim). BillTrack50’s free product does not offer saved searches or alerts of bill action; however, subscribers can create Custom Bill Sheets, which includes saved searches and saved bills. They can also create custom alerts, stakeholder pages, and widgets (see Custom Bill Sheets for more information). GovTrack’s state legislation offerings have less extensive search capabilities. From its State Legislation menu, GovTrack offers the user a choice between searching a specific state’s bills and searching the bills of all 50 states (the District of Columbia is not included). If all 50 states are chosen, the only search tool is keyword searching. If one specific state is chosen, the user may specify the session and the chamber as well (although chamber information is not always available). In all instances only the bill title and summary are searched, not the full bill text. The length of the summary depends upon the state. The results list includes state, session, bill number, and bill title. Clicking on the bill’s link takes the user to a page giving the history of the bill, link(s) to the full bill text and sometimes related bill text, and links to other available documents (such as voting records). GovTrack50 also offers free bill-tracking capability. It allows the user to set up e-mail, RSS, and onsite feeds for each state, either for every legislative action or for individually selected bills. Moreover, the user may set up multiple feeds containing the user’s choice of state(s) or bill(s), and for each feed choose whether to receive e-mail updates daily, weekly, or not at all. The user’s feeds, which the user can name, can be viewed on GovTrack’s site as well. Thus, for example, a user could have three feeds: one that updates the user weekly by e-mail about all California legislative activity, one that updates the user by RSS about three specific New York bills, and one that updates the user about five specific bills from five different states, when the user chooses to log in to GovTrack’s site. In sum, BillTrack50’s free search capabilities paired with GovTrack’s options for e-mail and RSS updates make both services well worth exploring for those interested in tracking state legislative activity.